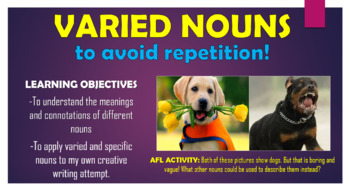 Varied Nouns to Avoid Repetition! 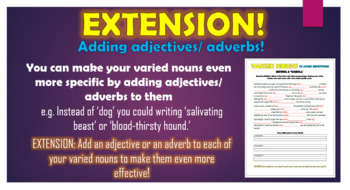 This engaging and informative lesson enables students to use a range of varied and precise noun choices in their writing, through considering the specific meanings of different nouns and their potential synonyms. 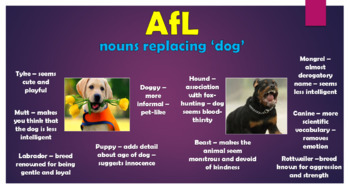 Students analyse examples of both effective and ineffective writing, considering the use of nouns, and editing where appropriate. They then apply this understanding to their own creative attempts. Peer assessing each other’s learning attempts. All resources are provided in Word (for easy editing) and PDF (to ensure formatting remains fixed between different computers). There are also opportunities for group learning, speaking and listening, peer assessment, and whole class discussion. 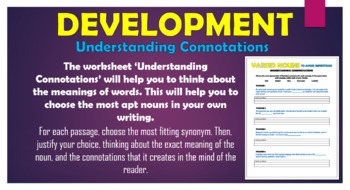 I originally used these resources with year 7/8 classes, however colleagues have used them for between years 4 and 9 with some adaptations. All images are licensed for commercial use, and image rights are listed on the last page of the presentation.